Figure 7: Selecting the "Show" –> "Pending Changes" context menu. Continuing with the example, Figure 8 below shows what the “TeamA Green Stream” looks like in the Pending Changes view. We can see that the stream node is no different than a repository workspace node in that it shows both Outgoing and Incoming changes. In this example, the “TeamA Green Stream” flows with the “Integration Stream” (i.e. 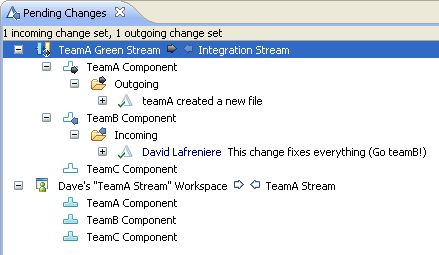 in the Stream editor for “TeamA Green Stream”, there is one flow entry, set as current and pointing to the “Integration Stream”). The context menu action of “Show” –> “Pending Changes”, when used on a stream node, uses the current flow target of the selected stream, which must be defined through the Stream editor. Figure 8: The "TeamA Green Stream" in the Pending Changes view. You can create baselines directly on the stream from within the Pending Changes view. You can also accept and deliver changes or baselines that do not introduce conflicts. Otherwise the operation would fail and you would have to accept or deliver the changes into a repository workspace, resolve the conflicts in the regular fashion and deliver the merged changes back to the intended stream. As already mentioned, one of the benefits of this work flow is that the Release Engineer does not have to load a repository workspace first before pushing his team’s changes to an integration stream. This is visible in the diagram by the fact that the component icons for the stream are empty, meaning they are not loaded. The other benefit is that the Release Engineer does not have to undergo a context change on his development workspace by changing the flow target to the integration stream, delivering the appropriate changes, and changing the flow target back to his team’s stream. Keeping both nodes in his Pending Changes view (his repository workspace and his team stream), he can work as usual and immediately see when changes are ready to be delivered to the integration stream, or when other teams changes are ready to be accepted into his team stream; all without requiring manual effort.